Walter L. Begent is drowned. Captain accused of throwing him overboard. Walter L. Begent, born May 12, 1871, in Georgetown, Tasmania, was the son of Clarence Begent and grandson of Eli Begent. The photo oposite was taken when he was 16 years old. Walter was only 30 years of age when he was lost at sea, and had lived a life full of adventure. His father Clarence was pilot and master of several ships on the River Tamar, and his son adopted a sea-faring life at a young age. It is probable that in 1891 he accompanied his sister Jennie to Scotland where she married Oscar Kustel, an American sea captain. Walter enlisted in the British army and was sent to India, where he saw service and was twice wounded on the north-western frontier. Going back to his old profession as a seaman, he voyaged back to Australia in the barque Freelove, and, leaving her in Sydney, went back to Tasmania to visit his parents in 1899. He left there for the last time in the three-masted schooner Victoria, across to Melbourne, Australia. On arrival in Sydney, he found he had missed the Freelove by two or three days, and so he took ship for New Zealand. His last communication to his mother Ann Begent was dated 'Frisco 1901, and wrote that he intended to be home for Christmas. From Auckland, he sailed to Fiji in one of the island traders. In October 1901 in a bar in Suva he met up with Captain John Voss who was looking for a mate to replace Norman Luxton. 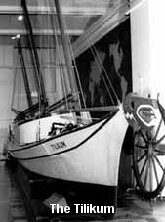 Voss and Luxton had sailed from Canada in a tiny 38ft boat the Tilikum and in which they had been planning to sail around the world emanating the famous voyage of Joshua Slocum in the Spray. Luxton had fallen out with Voss and gone on ahead to Australia. Captain John Voss and Walter Begent left Suva in the Tilikum bound for Sydney. During the yoyage, Voss claimed that Walter Begent was washed overboard in a storm taking with him the boat's only compass. 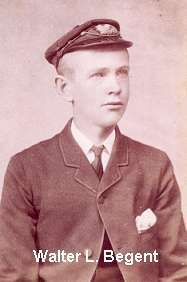 Norman Luxton, later in a posthumously published biography, accused Voss of throwing Walter (Louis) Begent overboard in a drunken rage. The first person to sail solo around the world was Joshua Slocum. Born in Nova Scotia, Slocum began his career as ship's cook, then became master and eventually captain on American merchant ships. 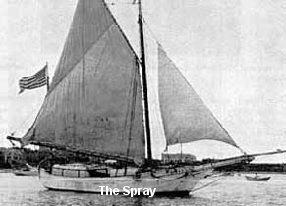 At the age of 51, he departed from Boston, USA, on 24th April, 1895 in his tiny 37ft sloop Spray which he had rebuilt from a derelict hull. He sailed around the world single-handed, a passage of 46,000 miles, returning to Newport, Rhode Island on 27th June, 1898. This historic achievement brought him fame and made him the patron saint of small-boat voyagers, navigators and adventurers all over the world. His book, Sailing Alone Around the World, which tells of high sea adventure became an instant best seller. In the autumn of 1909, Captain Slocum left on a voyage to South America and was never heard from again. Following the success of Slocum, several vessels set out to imitate or outdo the voyage of the Spray. One of the strangest of of these was a Nootkan Indian ocean-going canoe which was only 38 feet overall including the native figurehead. She had been purchased for $80 by Capt. John Voss from an old Indian who had been softened up, Voss claimed, with a "drap of ol' Rye." The original red cedar dugout was rebuilt with a stout keel, oak frames, and a keel of 300 lbs of lead. The sides were built up 7 inches, and a 5 foot by 8 foot cabin was erected with a cockpit for steering. Three masts were stepped to handle four small fore and aft sails, totalling 230 square feet of canvas. Inside went a half ton of ballast, between the floor timbers, and 400 lbs of sand in 4 bags to be used for trimming ballast. The boat was named the "Tilikum", an Indian name meaning, "friend". 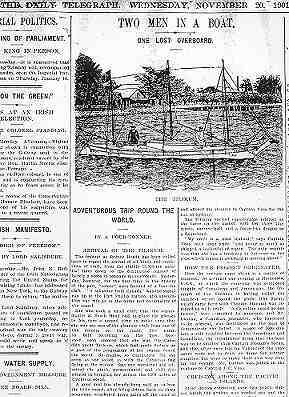 This strange craft left Oak Bay harbour in Victoria, British Columbia, Canada, on 20th May 1901. On board was Capt John (Jack) Klaus Voss and his companion Norman Luxton. Voss had been born in Germany or Denmark around 1861 and had gone to sea at 19, sailing the oceans in square-riggers and had a adventurous background including sealing, smuggling, gold prospecting in Colorado and British Columbia and had settled in Victoria where he co-owned a hotel. Norman Kenny Luxton was born on 2nd November, 1876, in Winnipeg, Canada. He had an interest in native Indian artefacts having worked at at an Indian agency in Winnipeg and later had moved to Vancouver where he worked in a newspaper office for the Vancouver Sun. It was probably during this period when he met Jack Voss in a bar and they talked of ships and sea adventures and Slocum's feat. Luxton was looking for adventure that he could write about, and found in Voss an experienced seaman. Both men were headstrong. Voss was described by young Norman Luxton as a hardened seaman, egotistical, subject to black and violent moods when drinking, full of bravado, aggressive, and provocative. Both men were later to write about their adventures (see references below) and their accounts differed on many points, but the idea of adventure and fame brought them together. On the morning they left on their circumnavigation, Luxton learned that Voss had registered the Tilikum as the Pelican in order to confuse the U.S. Coast Guard revenue cutter that was supposed to be waiting to intercept Voss, who was wanted for alleged smuggling of drugs and illegal Chinese labour. Luxton was below sleeping off the effects of attending an all-night dance at the Palace Hotel. He didn't wake up until the Tilikum entered the violent rips at Race Rocks, about ten miles from Victoria. The wind and tides were against them so they pulled in at Sooke Harbour and beached the boat to check on several leaks which had developed through open seams. Departing again, they attempted to double Cape Flattery but the weather again forced them to run back to shelter on the west coast of Vancouver Island. On July 6, they departed at last, bound across the Pacific for Pitcairn Island. They had not gone more than 25 miles when they were surrounded by a large migration of grey whales and were in danger of being struck and crushed. They sailed first down the west coast of North America experiencing fine weather and frequent gales. Voss taught Luxton how to sail and the techniques, many of which were ahead of their time, were later related in his book. Down through the Northeast trades they went, then into the doldrums and across the equator into the South Pacific. Luxton had hoped to visit Pitcairn Island on this journey (where Fletcher Christian landed the Bounty). Unfortunately the winds did not carry them to that destination. There were 4000 miles to cover before they would next see land. With Voss's expertise, the Tilikum survived many a storm and gale at sea. They made their first landfall at Penrhyn Island on 1st September. The two men had a violent argument here about landing, Voss wanting to continue on to Samoa because he feared the natives on Penrhyn would be hostile. But they landed and found anchored the two-masted schooner Tamari Tahiti, a French trading vessel, commanded by Captain George Dexter, a half-caste Tahitian-American, and his partner, the legendary Captain Joe Winchester, "an English gentleman and sailor." Their stay on Penrhyn was an eventful one, at least for Luxton, who related that he was trapped into a marriage by the mother of a local "princess," from which he claimed he escaped only by quick thinking, and on their final departure, they were attended, Voss said, by two young "princesses," who came aboard to wish them bon voyage. The Tilikum stayed in the Cook Islands until September 25, when Voss and Luxton departed for Samoa by way of Danger Island. They paused briefly here. On the passage to Samoa trouble erupted between the two with Luxton claiming that Voss threatened to "throw him overboard." Luxton armed himself with a .22 calibre Stevens target pistol and locked Voss in the cabin until they reached Apia. There they appeared to have patched up their differences and enjoyed a short stay and the hospitality of the locals. Luxton here became involved with a Sadie Thompson with "legs like mutton and breasts like huge cabbages," who wanted him to manage her store. Luxton visited the sights, including Robert Louis Stevenson's Vailima, and his tomb, wherein the famed author had inscribed his own epitaph, ". . . Home is the sailor, home from the sea,/And the hunter home from the hill." The first week in October they got underway for Fiji. Before they left, however, Luxton took Voss to Mr Swan's store and read to him an account of their differences with a statement of Voss's threat. The paper also stated that, if Luxton went missing between Samoa and Australia, Mr. Swan was to take such action as necessary to make Voss prove he had not killed Luxton. In his journal, Luxton claimed that Voss signed the statement as correct, although Voss makes no mention of this. On the third day out of Samoa, they sighted Niuafoo, where they were met by an island lass who swam out to beg for a plug of T and B chewing tobacco. Two days later they came to one of the Fiji islands where Luxton went ashore to explore with gun and camera while Voss tended to the ship. The next day they sailed for Suva. Luxton related that while ashore he had been met by a white official on horseback who told him a permit was needed from the Tonga government to land on the island, and that the natives were inclined to find "long pig" tempting as a dietary supplement. While in these waters, the two men were threatened by natives sailing catamarans, but whom were dissuaded from attacking when Voss fired an old Spanish cannon which they had aboard . It was during the passage from here to Suva that Luxton claimed they were shipwrecked on a reef, and that Luxton was left for dead on the beach until he came back to life again with a body full of cuts and abrasions. They stayed here several days patching the Tilikum, and then, on 17th October, reached Suva harbour and were taken in tow by the port captain's launch. In Suva, Luxton, who said the shipwreck on Duff Reef had taken his last reserve of strength, proposed to Voss that he take on another seaman in his place while he went on to Australia by steamship. Luxton left the Tilikum and took passage to Sydney, leaving Voss to recruit Walter Begent whom he found in a Suva bar. Luxton said he tried to get Begent to throw away the Tilikum's liquor supply before they departed, and warned him about Voss, to no avail. During the passage, Voss claimed Begent was washed overboard in a storm taking with him the boat's only compass. In his private correspondence, Luxton later said he felt sure that Voss killed Begent in a drunken fight and threw him overboard. He also claimed that Voss did not deny this when Luxton accused him of it. While he was convalescing in Sydney, Luxton primed the newspapers to expect Voss and the Tilikum (and no doubt share the publicity with him). When Voss finally landed, days overdue and Begent missing, the papers had an even better story. "The schooner yacht Tilikum arrived at Sydney on Tuesday last, when the commander (Captain Voss) reported the loss of his mate and only companion Mr Walter L. Begent, a Tasmanian. "We had an awful time of it", was the first remark made by Captain Voss to a representative of the "Age". " The weather was simply awful off the coast, and I am sorry to say that I lost my companion. He fell overboard and was drowned and I have been entirely on my own ever since. Such an experience I have never had during my long term at sea." Continuing, Captain Voss said: - "It was five days after leaving Suva, on 28th uit. about midnight, that my mate Louis Begent, was lost over the side. We were running about 5 knots an hour, when the light went out in the binnacle. I was on watch at the time, and having the moon well overhead did not call the mate until midnight. I then left him in charge and went below to fix the binnacle light. Having lit it, I passed it out of the cabin into the cockpit to my mate, who caught hold of it. Just then the yacht gave a lurch. I had told my mate when he joined me to always hold on when moving about, but he did not heed my instructions, and when the boat lurched he went over the side, binnacle and all. I immediately put the helm hard down and called out to him, but got no answer. I then put the drag out and lay to until daylight, meanwhile keeping a sharp lookout for Begent, but nothing was heard or seen of him, and after remaining twelve hours in the locality I set sail and continued on my course to Sydney. After that my troubles began. Having lost the binnacle, I had nothing but the stars to steer by at night. I would have managed right enough but for the gales. For many days and nights I was drifting about at the mercy of the elements, and did not know where I was. Occasionally I picked up a star and made a good course, but then the weather became bad, and all I could do was put out the drag and let her drift. For four days I was without any sights, and for three days I was in a violent northerly gale. This brought me down here, and on the coast I got a southernly current, which took me 50 miles south of the heads. I, however, managed to pick up the light at 9pm on Monday and got in all right today." After his arrival in Sydney, Luxton said Voss was in the hospital for weeks suffering from exposure and "sickness he contracted through the women on the islands". The two erstwhile adventurers made numerous appearances together in Australia, then parted company in Melbourne. Luxton never saw Voss again, and returning to Canada, married, and founded a tourist haberdashery, trading post, and taxidermist shop in Banff. He died in 1962. Meanwhile in Australia, the Tilikum was placed on display by Voss, along with the British Columbia Indian artifacts which were still with them. After numerous adventures, Voss sailed to Hobart, Tasmania (as Slocum had), where one of his greeters was Walter's sister Jemima Clay, whom Voss reported, bore him no ill will. Voss then sailed to New Zealand where he was feted by the locals and gave lecture tours. In Dunedin, Voss had his name changed to McVoss and the ladies of the town sponsored Tilikum in a floral parade, decorating it with flowers from keel to tops of masts. He became friends with Horace Buckridge, who had just returned from Captain Scott's South Pole expedition, and who joined the Tilikum as a crew member for a time. Voss departed New Zealand 17th August, 1902, with MacMillan, a well-educated man of refined manners, for the New Hebrides and the Great Barrier Reef. They explored through Torres Strait and into the Indian Ocean, eventually to Durban South Africa with many adventures. A new mate was signed on and the next stop was St Helena then Pernambuco in Brazil, which Voss had not visited since 1877 when he was on his first voyage to sea in a 300-ton sailing ship out of Hamburg, Germany, bound for Guayaquil, Ecuador. They remained two weeks in Pernambuco, and on 4th June 4, at 3 pm.., they were towed to sea and the long sail uphill to London by way of the Azores began. On 2nd September, at 4 pm, the jetty at Margate was rounded, and thousands of people lined up to watch. From the distance came a voice: "Where are you from?" "Victoria, British Columbia." 'How long have you been on this voyage?" "Three years, three months, and twelve days." In England, Captain Voss was feted for his adventures, and nominated for a Fellowship in the Royal Geographical Society although for unknown reasons he was never elected nor ever officially became a member. The vessel was exhibited at Earls Court, London in 1905 after which it was sold and passed through a number of hands before it was discovered lying derelict on the Thames in 1929. Tilikum was crated and returned to Victoria by freighter where restoration was carried out by the Thermopylae Club. Since 8th June, 1965, the Tilikum has been on display at the Maritime Museum in Victoria, British Columbia, Canada. Voss returned to British Columbia, but sold his hotel interests in 1907 and went to Japan where he worked in the sealing industry till sealing was prohibited by law for 15 years commencing in 1911. Voss sailed in 1912 in The Sea Queen, but the planned world cruise was ended by a typhoon and a limp back to port a month later under jury rig. Voss died of pneumonia in Tracy, California, on 27th February 1922. Venturesome Voyages of Captain Voss by John Claus Voss, Charles E. Lauriat Company, Boston, 1913. First published in Yokohama in 1913 a second edition appeared in London in 1926. Luxton's Pacific Crossing, by Norman Kenny Luxton, edited by Eleanor G. Luxton, Gray's Publishing Ltd., Sidney, B.C., 1971. Articles from the Launceston Examiner and Daily Telegraph kindly provided from the Tasmanian archives by Nancy Salter and Meg Daly (nee Begent).